I was intrigued by the title of this new book from Victoria Summerley, I wanted to know who the secret gardeners could be. I was sent a review copy and whilst I have not paid for this book, my opinions are as ever my own. I was impressed with the book when it arrived as it is nicely large and pleasantly heavy like all good books that cost around £30 (though you can buy it for less at a well known online book store) should be. The 'secret gardeners' referred to in the title are a variety of famous people. There are singers, actors, designers, entrepreneurs and more represented and what links them together is that they are all creative. These people live in the most magnificent houses with equally stunning gardens. Most of the gardens are private, but some have some public interaction. 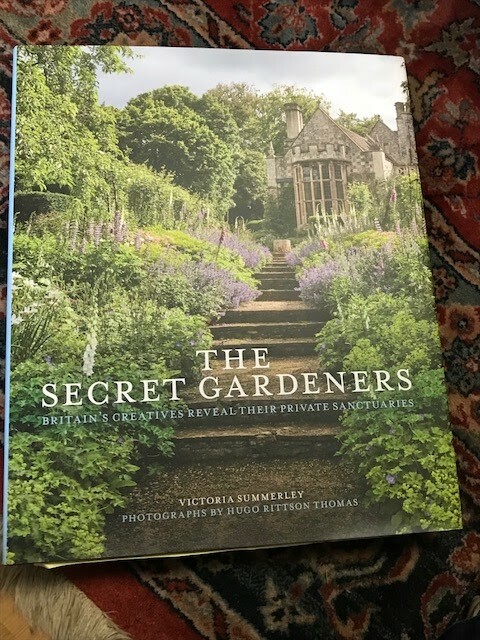 Whilst the people might be 'celebrities', this book is not about their fame, it is about their gardens and this is why I enjoyed the book so much. I turned each page making 'wow' noises to myself. The gardens vary hugely in character as do their owners. There were many aspects of the gardens that caught my eye: Terry and Maggie Gilliam's garden has strong connections to Terry's work. The lion and rhinoceros cannons from Baron Munchausen fit in perfectly with the garden. The tsunami hedge in Allen Jones' garden is also a thing of wonder. There is not a disappointing garden in the book, they have all earned their place. By learning more about the gardens I felt that we were getting interesting insights and I found myself drawn to the owners as to own a good garden must say something good about them mustn't it? What all of these gardens show us is that their owners love their gardens and connect with them. I particularly appreciated the people who ensured that their gardeners got a mention and Hugh Fearnley-Whittingstall won the 'I will be photographed with my gardener' award. I will never to be able to afford to replicate what they have on the scale that they do; but I can draw inspiration from what I see. This book is a fascinating insight into that common ground I have with these secret gardeners, which is the garden.